“Conducting a legally compliant ICO is more challenging than ever and government regulators are watching every move,” states a Crypto-Attorney and Enterprise Strategist Gordon Einstein. Find out all the insights related to establishment of Legally Compliant ICO, Securities Regulation and the Simple Agreement for Future Tokens. staying on the good side of the SEC/FCA/MAS. 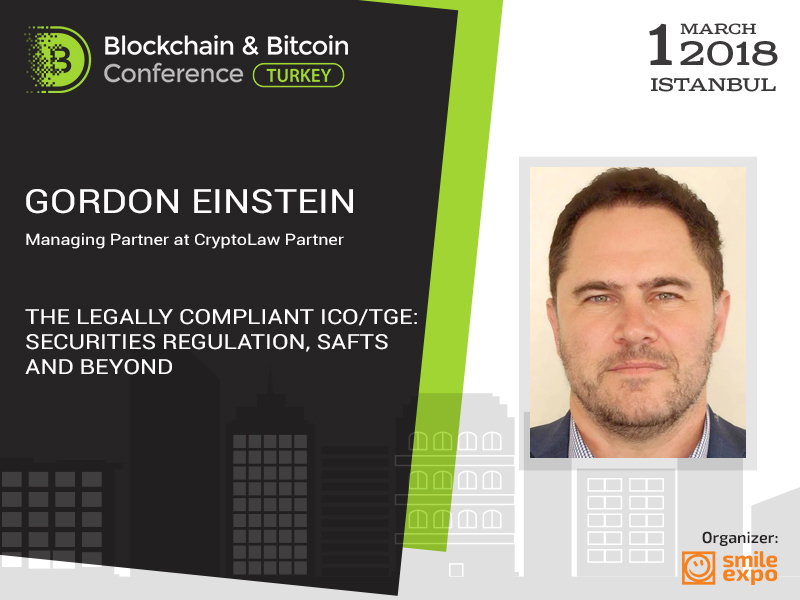 Gordon Einstein: Managing Partner at CryptoLaw Partner, Founder of AdaptiveSky and as he calls himself, hybrid Crypto-Attorney and Technologist. Initially, speaker’s practice has been focusing startups, venture investment, intellectual property and regulatory compliance. Subsequently, Gordon founded AdaptiveSky, premier technology platform currently servicing clients located in New York and California primarily. The service provider has also been awarded Worldox Systems Integrator status (the highest certification level available) by World Software. Gordon has been involved into Blockchain and related technologies since 2012. By the 2016 works with FinTech startups and funds primarily. Get your ticket in order to find out more about legally compliant token sales!